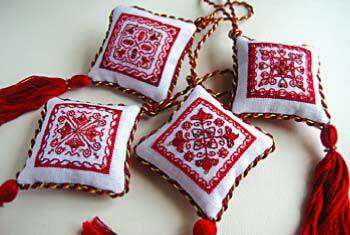 This set of four 2002 blackwork Christmas decorations is a companion set to the 2005 decorations. Shown worked in gold and overdyed red, they could easily be worked in another colour scheme, if preferred. These decorations make excellent gifts for school teachers, carers and special friends. They are also great for stitching swaps. 4 charts and detailed instructions included. Worked on 28 count linen, with stranded floss and gold Mill Hill beads.